Bowling, whose district includes Tullahoma, has been working in this space for a long time and has gained knowledge from technical experts and business leaders. LightTUBe, her community's municipal fiber optic network, has been serving residents, businesses, and municipal facilities since 2009. The network has boosted economic development, improved education, and public savings, but nearby towns still suffer with older Internet infrastructure because LightTUBe is precluded by current law from expanding beyond its service area. It’s clear that she’s listened to their needs and encapsulated those needs into a smart vision for rural Tennessee’s broadband future. During her presentation, she discussed the fact that SB 1045 relies on a symmetrical 25 Megabit per second (Mbps) definition of broadband; any size business needs to be able to send data as efficiently as it receives it. The Senator also took some time to dispute one of the common misconceptions about how munis are funded. She noted that ratepayers, not taxpayers, fund Tennessee’s municipal networks that bring benefits to everyone in the community. She stressed that municipal networks and cooperatives in Tennessee are managed well and provide the connectivity that people need when large corporations won’t serve their areas. We can no longer leave the people of Tennessee hostage to profit margins of large corporations. We appreaciate what they’re doing. We appreciate where they do it, but in rural Tennessee we will never meet their profit margins and so we can no longer be held hostage when we have the ability to help ourselves. Sen. Frank Nicely from Strawberry Plains commented that his community was very supportive of the bill. He noted that the state had “done well” through deregulation, which is the goal of SB 1045 and he wondered why the administration did not support a deregulation bill when the current President was an advocate for deregulation. Apparently, the current Governor does not support SB 1045, instead continuing his support of last year’s action, which provided funding to rural communities without removing limits to authority. Nicely expected the Governor’s office to also support SB 1045. "I just don’t understand with what’s wrong with taking the bridle off and letting the horse run,” he asked an official from the state’s Department of Economic Development. “I haven’t heard a good argument agains this bill yet,” he said. The bill would also eliminate the limitations that hamper where electric cooperatives can offer broadband services. Telephone cooperatives are now able to collaborate with other telephone systems beyond their service area by interconnecting their lines for telephone service; this bill expands that authority to broadband service. Likewise, electric cooperatives obtain the express ability to collaborate in a similar fashion with other entities for broadband connectivity to members and nonmembers. Sen. Kerry Roberts from Springfield asked Sen. Bowling a few questions about fixed wireless. Often we see legislators argue that fixed wireless is a better alternative than fiber for both rural and urban areas because it’s cost effective. What legislators and others tend to forget is that, even though fixed wireless technology seems to improve every year, it still requires fiber for backhaul. The more we rely on fixed wireless, the more fiber we will need. As Sen. Bowling pointed out, rural Tennessee’s trees and mountains make widespread deployment and dependency on fixed wireless an unrealistic option with existing fixed wireless technology. While the situation may change in the future, rural folks need to connect now with future-proof fiber to participate in the 21st century economy. On March 6th, the Committee took up the bill after using a week to study it. At the hearing, Sen. Bowling presented petitions from several rural counties signed by residents and businesses in areas without high-quality connectivity. Many of these communities are neighbors to places like Morristown, Chattanooga, and Tullhoma, an would like to receive Fiber-to-the-Home (FTTH) from their neighbors, but current law prevents it. Joe Malgeri, a consultant from rural Jefferson County, Tennessee. He presented research that supported the connection between municipal networks and economic development. Mr. Malgeri used historical and geographical analysis and made connections between a 1999 law that allowed municipal electric utilities to offer Internet access and economic improvements in the communities that now have fiber networks. Sen. Nicely once again expressed support for the bill. He described how his district is near Morristown and Newport but communities in his district are not able to receive services from them. He “doesn’t have a good reason to give them” for why people in his community don’t have access to high-quality Internet service. No testifiers opposed the bill and none of the members offered comments in opposition to the bill or gave reasons for their votes other than Sen. Nicely. Members voted against advancing the bill with 3 yeas and 4 nays. In the end, the Committee let down rural folks in Tennessee and chose to vote to preserve the telephone and cable monopolies. We hope rural Tennesseans were watching and remember moments like this the next time they go to the voting booth. Sen. Bowling, who’s dealt with this kind of result in the past told the Committee that she will be back with another bill to help rural Tennesseans get the Internet access they need. Thank you, Senator Janice Bowling. 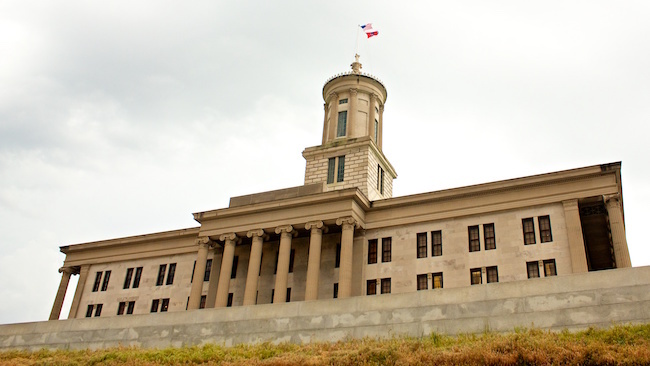 Image of the Tennessee State Capitol by Andre Porter (imagN Images) (Own work) [CC BY-SA 3.0], via Wikimedia Commons.